CSML is an SPV (Special Purpose Vehicle) formed for the sole purpose of implementation of the smart city mission at the city level in Kochi. The SPV will plan, appraise, approve, release funds, implement, manage, operate, monitor and evaluate the Smart City development projects. In April 2015, Government of India initiated the Smart cities Project and in June 2015 the Ministry of Urban Development (MoUD), Government of India, launched the prestigious Smart City Mission. 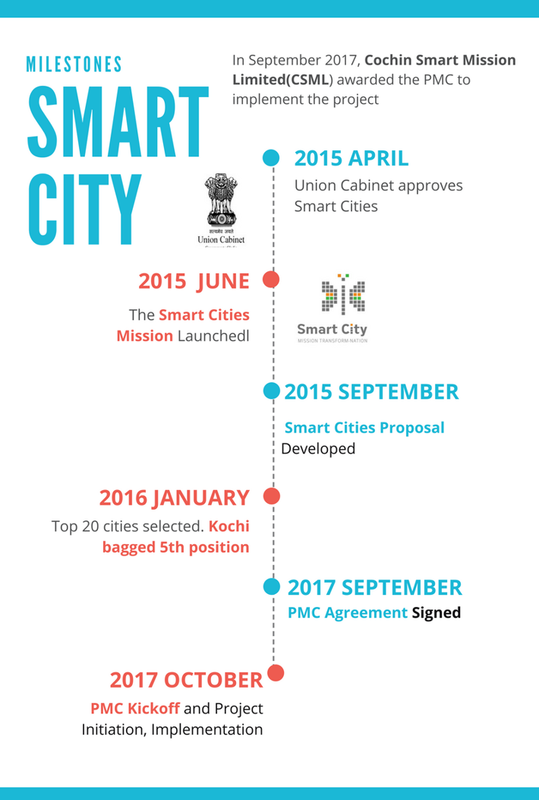 Kochi submitted its proposal for participating in the All India Smart City challenge as a candidate city, to the Ministry of Urban Development, GoI before 15th December 2015. In January 2016, names of twenty successful cities were declared and Kochi bagged 5th position among 100 cities and became one of the first 20 cities to receive funding support in the first year. In September 2017, Cochin Smart Mission Limited(CSML) awarded the Project Management Consultancy (PMC) to implement Area Based Development to the consortium of M/s IPE Global Limited (Lead Member) & M/s Haskoning DHV Consulting Private Limited (Consortium Member).